The Aerie of the Altmer, the city of Cloudrest clings to the highest slopes of the peak of Eton Nir, tallest mountain on Summerset Isle. Somehow, its thin air is as heady and bracing as chilled nirnroot wine. 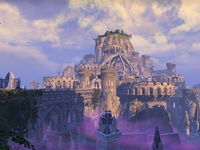 Cloudrest is a city found on the mountain of Eton Nir in Summerset. It serves as the home base for the Welkynar Gryphon Knights and their Aerie. Due to an unforeseen catastrophe, the once-thriving city stands cloaked in a toxic, purple mist. To ensure that the corruption does not spread to the rest of the island, the city is under quarantine by the Divine Prosecution, who were forced to evacuate the city and barricade the main gate. 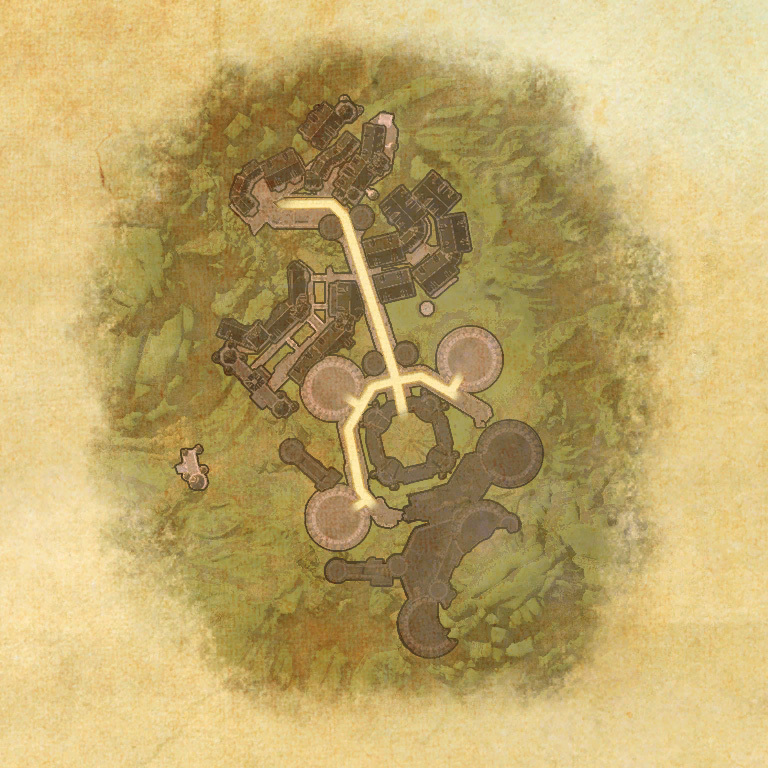 A cart from Alinor can be taken to get there, and a side entrance lies straight to the west: there is a note found next to it. Cloudrest Objective: Help Olorime take back Cloudrest. Checking on Cloudrest: Check on Vandoril's mother in the city of Cloudrest. Woe of the Welkynars: Help a Gryphon Knight defeat a powerful Sea Sload sorceress and save Cloudrest. The starting area of Cloudrest is a small market that hosts all available crafting stations. Lembien the merchant and Wailimo the mystic can be found here too, alongside several injured or fleeing citizens. Wailimo's Personal Account can be found near the mystic. Welkynar Olorime waits by the market with her gryphon, Darremalatu, seeking aid to stop Z'Maja and save Cloudrest. Heading north, you pass through a large gate and onto a vast bridge that leads to the main boss. The domed citadel in the center serves as the main boss arena, occupied by Z'Maja. Surrounding the main arena are three circular ramparts where each of the Welknar knights can be fought. Littering the ramparts are signs of a battle as displayed by abandoned siege weapons and fortifications. 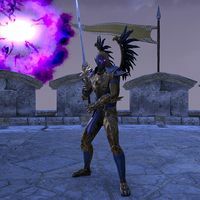 Although Welkynar Olorime recommends a divide-and-conquer approach to the battle, it's possible to face Z'Maja and up to three Welkynar knights at the same time. This makes the boss fight significantly more challenging and is commonly described as "Cloudrest +1", "+2" or "+3" (depending on the number of Welkynar knights you choose to fight alongside Z'Maja). Defeating Z'Maja alongside multiple Welkynar knights rewards players with one or more Welkynar Style Motif Fragment. Ten fragments can be combined with a Welkynar Binding to create a single random Welkynar Style motif chapter. The main mechanic of the miniboss battles is the portal to Z'Maja's Shadow World, which she uses to summon her minions into the battle. 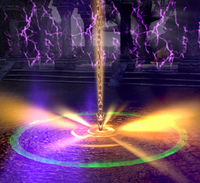 This portal will frequently appear in the center of the arena during every mini-boss battle and can be entered by pressing the synergy button. Once in the Shadow World, the objective is to destroy three crystals around the perimeter of the arena. When a crystal is destroyed, it releases a Malevolent Core and also spawns a spear of light at a random location in the arena of the normal world. In the normal world, another player must synergize the spear of light in order to send it down into the Shadow World. Once the spear of light has been sent, a player in the Shadow World must pick up the Malevolent Core and quickly carry it to the spear. The player who carries the Malevolent Core will receive a damage-over-time status effect until it has been delivered. Note that this DoT deals Oblivion Damage, meaning damage shields are ineffective against it. The portal to the Shadow World will close once all Malevolent Cores have been dealt with. If the portal opens once more, the players who entered the portal the first time cannot enter again. 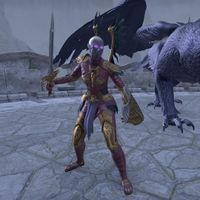 This means a different group of players will be responsible for dealing with the crystals. This mechanic can be overcome by organizing into two groups who take turns closing the portal. The Welkynar knight and their gryphon will empower each other if they are in close proximity. Periodically during battle the gryphon will take flight and leave damaging whirlwinds on the ground. When either the Welkynar knight or the gryphon is killed, an enrage mechanic is triggered in the survivor and numerous Nocturnal Creepers will spawn into the arena. The creepers have a powerful snare ability that can only be dodge-rolled out of. Welkynar Olorime will periodically aid the group by casting a bright sigil on the floor. Running across the sigil will provide players with a Major Courage buff. Welkynar Galenwe wields a greatsword and his elemental magic is ice. In addition to the shared mechanics noted above, his signature abilities are an uppercut and a powerful ice AoE. Once his health drops below 50%, he gains the ability to perform an ice explosion attack. This explosion will kill any player caught in the area where the damage circles overlap. His gryphon Falarielle has an ability named Hoarfrost which inflicts a player with a damage-over-time and snare effect. This effect is displayed as a white circle at the player's feet. Hoarfrost deals constant ice damage, but after seven seconds it can be discarded by pressing the synergy button. The discarded Hoarfrost will remain on the floor where another player must pick it up and repeat the process. After the third player has discarded Hoarfrost it will disappear from the arena for a short while. Failure to pick up the Hoarfrost effect will cause it to shoot ice projectiles that increase in strength the longer it is left unattended. Welkynar Siroria wields a sword and shield and her elemental magic is fire. In addition to the shared mechanics noted above, she uses the abilities of the Dragonknight class - including Burning Talons and Flame Whip. Once her health drops below 50%, she gains the ability to perform a leaping fire shockwave. Her gryphon Silaeda has an ability named Roaring Flare which inflicts a player with a damaging status effect. This status effect is displayed as a red circle at the player's feet. Roaring Flare explodes after a short period of time inflicting a fatal amount of damage unless they are able to get close to at least two other players and share the damage between them. Welkynar Relequen wields a staff and his elemental magic is lightning. In addition to the shared mechanics noted above, his main ability is a lightning shockwave that stuns all players it hits. His gryphon Belanaril has an ability named Voltaic Overload which inflicts a player with a damage-over-time effect. This effect is displayed as a blue circle at the player's feet. Overload causes the weapon the player is currently holding to deal constant lightning damage. To overcome this mechanic, players must swap to their secondary weapon for at least ten seconds until the effect wears off. Failure to swap weapons (or swapping back before the effect has worn off) is fatal to both the player and nearby allies. Z'Maja's attacks are all magic-based. Notable is her powerful Mind Blast attack, which targets all players in front of her. Her Dark Orb attack spawns three small orbs that will stun any player who touches them. If the orbs are not destroyed in time they will converge and target a player, killing them. Note that when an orb is destroyed it inflicts nearby players with damage-over-time effect. Crushing Darkness is an ability that targets the tank who is currently taunting her, and the player furthest from her, creating a void beneath their feet. In the Shadow World the Shade of Z'Maja can be found. 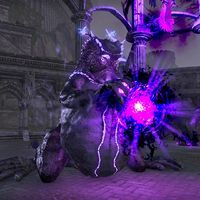 The shade can attack players and her heavy attack cannot be dodged, meaning players with high resistances (such as a tank) are required. The number of crystals is increased to six, however only three of them contain Malevolent Cores. Only crystals that release a core will spawn a spear of light in the normal world. Some time after entering the Shadow World, the Shade of Z'Maja will release a dark explosion that rapidly expands from the center of the arena. To avoid damage from this fatal explosion, players are required to find and activate Olorime's synergy, named "Wind of the Welkynars". This will uplift the player to an upper platform which is outside of the blast radius. Almost immediately after dodging the blast, players must jump back down into the arena or risk being killed by another explosion on the upper platform. While the portal is active, a cone-shaped beam will emit from the portal (in both worlds) and send any player caught in its path into the Shadow World or vice-versa. 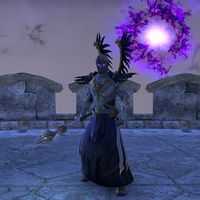 If the portal is not closed quickly enough, all players will begin to helplessly levitate under Z'Maja's control and she will instantly kill the entire group with the Dark Detonation spell. After the portal has been closed, a Yaghra Monstrosity will spawn in the arena. Once Z'Maja's health drops below 40%, Nocturnal Creepers will spawn in the arena and begin ensnaring players. Once Z'Maja's health drops below 5% she will summon her shade from the Shadow World to aid her, while she herself becomes immune to all damage. Now the shade must be killed in order to finally defeat Z'Maja. After about 20 seconds, players will receive the Baneful Mark debuff which drops your Health to 20% of its maximum value. It also applies a growing damage-over-time effect. To remove the debuff, players must heal their health to 100%. Baneful Mark can be reapplied to players throughout this phase. In addition to fighting Shade of Z'Maja, who inherits all of the magical attacks from Z'Maja herself, numerous Nocturnal Creeper will spawn in the arena until the end of the fight. 3 items: Gain Minor Aegis at all times, reducing your damage taken from Dungeon,Trial, and Arena Monsters by 5%. 5 items: After successfully blocking, you have a 50% chance to grant Empower to 3 allies within 15 meters, increasing the damage of their next Light Attack by 40%. This effect can occur once every 1 second. 5 items: After successfully blocking, you have a 50% chance to grant Empower to 3 allies within 15 meters, increasing the damage of their next Light Attack by 40%. This effect can once occur every 1 second. 3 items: Gain Minor Slayer at all times, increasing your damage done to Dungeon, Trial, and Arena Monsters by 5%. 5 items: Your Light and Heavy attacks apply a stack of harmful winds to your target for 5 seconds. Harmful winds deal 2-200 Physical Damage per stack every 1 second. 20 stacks max. 5 items: Your Light and Heavy attacks apply a stack of harmful winds to your target for 5 seconds. Harmful winds deal 2-200 Physical Damage every 1 second. 20 stacks max. 5 items: Dealing direct damage with a single target ability creates a ring of fire beneath you for 10 seconds. This effect can occur once every 10 seconds. Standing in the ring grants you a stack of Siroria's Boon for 5 seconds. Each stack increases your Spell Damage by 30. 20 stacks max. 5 items: Casting abilities that leave an effect on the ground in combat will create a circle of might for 10 seconds. You and your allies in the circle gain Major Courage for 30 seconds, increasing your Weapon and Spell Damage by 258 for 30 seconds. This effect can occur once every 10 seconds. 5 items: Casting abilities that leave an effect on the ground in combat will create a circle of might for 10 seconds. You and your allies standing in the circle gain Major Courage for 30 seconds, increasing your Weapon and Spell Damage by 258. This effect can occur once every 10 seconds. This page was last modified on 28 February 2019, at 21:51.